Adventurers find passion in the outdoors, and with the technology available in today’s market, hikers and backpackers alike can stay safe and enjoy their adventures to the fullest. The best hiking watch is one of many tech-savvy products that not only provide you with convenience functions, but essential, life-saving functions as well. 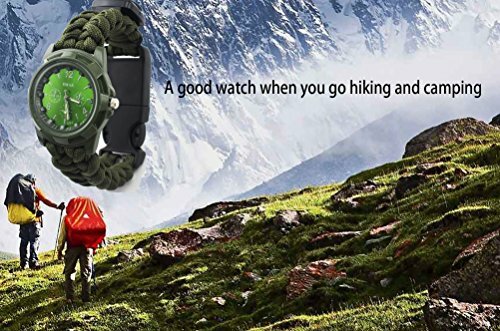 Great hiking watches can perform a wide variety of functions. They are designed to not just show the time and date, but also give you other crucial information, like location, air pressure, altitude, dusk/dawn times, and more. These types of watches have become extremely popular among many outdoor-adventurers, and it’s easy to see why. The best hiking watch is much more than just an accessory, for many it’s a necessity. Hiking watches minimize the tools and instruments you need while you’re hiking, like compasses, maps, notepads, etc. That means you can worry less and enjoy your outdoor-experience more. What should you look for in a hiking watch? Hiking watches have come a long way in recent decades, they can perform a lot of functions. It’s essential that you first determine what you need the watch for. If you plan on being around water, you should focus on water-proofing features, while mountain-hikers may benefit from a high-quality barometer or altimeter. Barometer: This feature detects various changes in the atmosphere, allowing you to predict the weather and stay safe. Altimeter: This feature detects your altitude in comparison to the sea level, using barometric pressure or GPS-data. Altimeters are great for navigating and finding your location on a map. Compass: One of the oldest and most essential tools for any traveler, compasses show you the four cardinal directions and is invaluable when it comes to navigation. Thermometer: Some watches can detect the temperature of the environment around you, which comes in-handy on multi-day excursions or emergencies. Material durability: Watch bands and clock-faces can be made out of many different materials, which are designed to withstand various degrees of impact. GPS: It’s no surprise that GPS-support is an added feature on many modern-day hiking watches. GPS allows you instantly have the coordinates of your location and other valuable information. 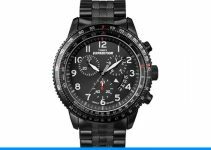 Waterproof/water-resistant: Waterproof and water-resistant are two very different things, so you’ll want to pay attention to the hiking watch’s waterproofing-rating to ensure it can withstand the right around of water. To help you pick the best hiking watch for you, we’ve compiled a list of the best hiking watches on the market. These watches have all the essential functions you need; plus, much, much more. There’s a hiking watch on this list to fit the bill whatever your needs may be. This modern-looking watch is from one of the most trusted watch brands in the world. It has a sleek, but functional design that can be found in 6 different color options. You can find 2 camo options, as well as black, red, white, and green choices. The band is made from a durable but flexible resin material, while the large, digital display is made from a high-quality acrylic that is shock resistant to I.S.O. standards. A stainless-steel top plate is included for added durability. The Expedition Grid Shock Watch is water-resistant, only to 100m; idea for swimming or snorkeling, but not diving. Additional features include time/date, stopwatch, countdown timer, vibration alarm, hydration alerts, and an Indiglo light-up watch dial that ensures you have essential information even in the dark. The watch only weighs 4.8 ounces and comes with an easy-to-adjust buckle clasp, so it’s light and comfortable. This Timex watch does not come with a barometer, altimeter, or other advanced features, so it’s most suitable for daytime/light hiking adventurers, or beginners. Even though there’s 7 different color options for this advanced watch, the most popular seems to be the green. It has a simple design, with a simple black band, and accented dial/display. The watch is average-sized, so it doesn’t get in the way, and the digital display is easy to read. You can read information at night as well with the electro luminescence backlight. It’s created with a German sensor which allows it to have multiple functions. The LAD Weather hiking watch can be used as an altimeter, barometer, compass, thermometer, chronograph, alarm, clock, and stopwatch. The sensor also allows you to have access to the weather-prediction technology, which shows you various icons on the watch-face that let you know whether sun, clouds, or rain is coming. It isn’t waterproof and should only come in contact with mild splashes or moisture. This watch is designed for adventurers who plan on spending more time above sea-level than below it. The altimeter can measure up to more than 30,000-feet above sea-level, and both the barometer and altimeter’s data can be graphically displayed to show tendency over a time of up to 34 hours. This cool watch has a design that is both stylish and functional. The watch band serves purpose all by itself, as the military-grade paracord band can be unraveled to up to 12 feet (with a bearing-weight of up to 550 pounds). The band also comes with additional features built into the design, like a knife blade/scraper and a firestarter made of flint. This Survival Watch is ideal for hikers, backpackers, climbers, and all other outdoor adventurers who need a watch that does it all. Ibreathtech’s hiking watch is great for emergencies and non-emergencies alike. The paracord design can be found in 4 different colors, such as navy, camo, grey, and black. Additional features include a compass, whistle, and thermometer that can help you find your way, alert you to temperature changes, and help you find help if you get lost. It doesn’t come with a barometer or altimeter, but this 7-in-1 hiking watch offers every function of a digital watch, with the added features needed in a survival situation. The band is non-adjustable (and 9-inches long) and should not be in contact with more than small splashes of water. It may not say “hiking watch” right in the name, but this clever watch has everything any outdoorsman needs. 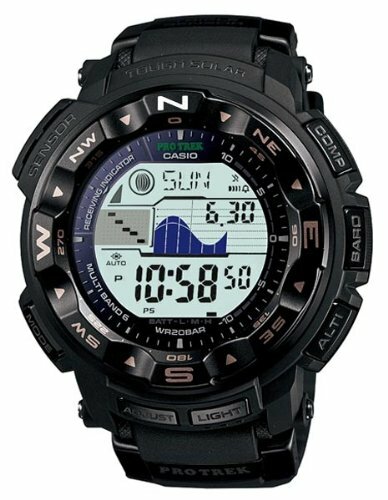 The Pathfinder has all the function you would expect from Casio, in a small, comfortable, band and display. Quite arguably one of the coolest features is its solar-powered capabilities, which ensures your watch never stops working (even in survival situations). The batteries can last for up to 6 months, without any solar-charging. It comes in a simple, black/grey design that would suit most men’s taste, with 51-mm stainless-steel case and a mineral dial window. The band is made of a durable resin, is easily adjustable with a buckle closure, and the digital display can show a multitude of information. It is water-resistant up to 100m, ideal for most exposure to water (except diving). In addition to its auto-calendar and time functions, the Pathfinder contains a city-code display, five daily alarms, barometer, altimeter, compass, stopwatch, battery-power indicator, and power-saving function. The Pathfinder even has a backlight for nighttime and is resistant to low temperatures of up to –10 degrees. For those hikers who also have style, this hiking watch by Armitron Adventure could match your taste perfectly. It has a modern, large design that is bright-orange in color throughout the resin band and around the face, with black accents throughout. The riound, digital display sits upon a brightly-lit screen, where it shows you date, day, time, and more. The durable display case measures 50.8mm, so it’s large and easy-to-see. While this hiking watch focuses more on style, it’s ideal for day-adventurers and the more-casual hiker. 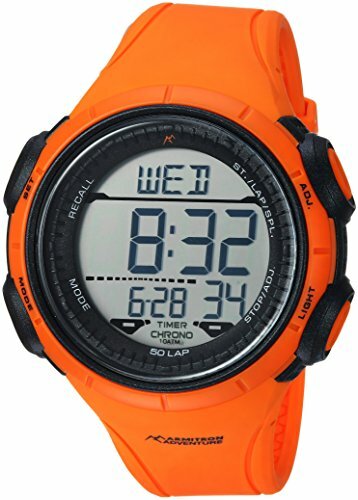 It is water-resistant up to 100m (swimming-appropriate) and has chronograph/alarm features. It does not have a barometer, altimeter, or other advanced survival tools, so it’s best suited for those who carry additional supplies with them. Easily adjustable and super-stylish, this Armitron Adventure watch is great for wearing straight from the office to your next adventure. This hiking watch has all the appeal of a traditional Casio. Black-in-color and simple, it has the exterior labels of direction and function, and an adjustable strap. 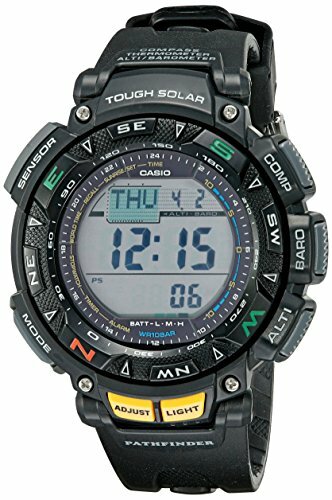 The display and clock-face aren’t what you would expect from a Casio however, since it has a fully-lit, extremely-cool, dual-layered, LCD display screen. This screen not only shows things like date/time, graphs, alarms, battery-power and more, but also features a fully-automatic backlight with afterglow. But the ProTrek doesn’t just look cool, because it is loaded with functional features for even the most avid hiker. It has fully-functional solar-capabilities, is resistant to low temperatures of up to 14 degrees and is water-resistant up to 200 meters. 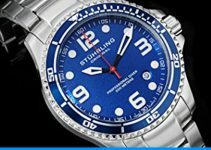 Additional features include an altimeter, barometer, compass, triple sensor, thermometer, tide/moon graph, world time, alarms, timer, and more. This hiking watch is perfect for anyone, especially those who take their outdoor adventures seriously. It hits all the marks in style, design, and function. You can purchase this ultra-sleek watch in 5 different colors: graphite, black, white, amber, and sapphire black. 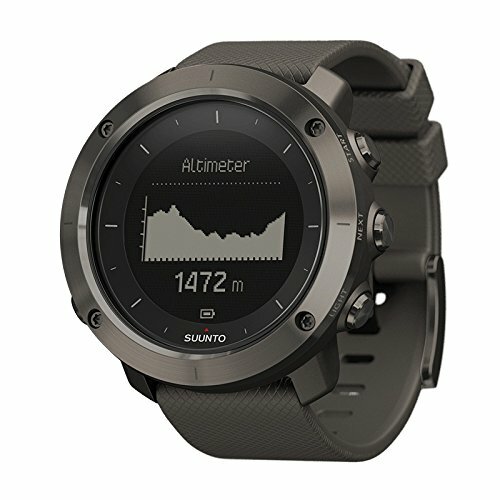 If you’re looking for a watch that has function but doesn’t “look” like a hiking watch, you should enjoy this Suunto product immensely. The Traverse watch has metallic, sleek details that mimic designs on upscale watches, with an adjustable band and fully-digital display. It is water-resistant up to 100m, shows time/date, has various alarm settings, and can be used at night with its built-in flashlight. It can show weather trends, sunrise/sunset times, and more. The Traverse watch can even connect to your iOS or Android device for GPS features. You can receive real-time mobile notifications, track your steps and calories, monitor your speed, distance, and altitude, and get a real-time view of your recorded route. Not only can you re-trace your steps, but the Movescount app can also help you find new places to explore. This hiking watch can truly do it all; looking good in board meetings and offering convenience and function out in the wilderness. The base model of the Epic watch-line is about as high-tech as you can get. It uses a flexible, durable, adjustable, black band to hold up an amazing, 1.4-inch, high-resolution, touchscreen display. 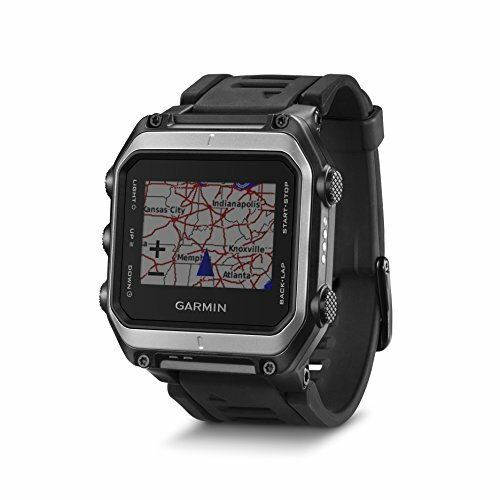 Garmin added style and sophistication to functionality; giving you the most tech for your money. The touchscreen is entirely in-color and can show you a wide array of information, like time/date, location, and more. The Epix watch gives you access to a compass, barometer, and altimeter. The GPS is enabled by a built-in, stainless-steel antenna that gives you access to mapping features and more. You can add locations and maps to your watch through the use of an 8GB, built-in memory drive. You can also receive information like weather, fitness information, and mobile alerts when you connect your watch to a compatible Bluetooth device. Of course, Epix watch also gives you access to the wonderful world of Garmin apps and support. Much like the Epix-line, the Fenix watch is full of sophistication and style. It can be worn for a day in the office or a day in the wilderness. The Fenix 3 HR has a black, silicone band that is soft and adjustable. It has metallic details and a 1.2-inch chroma display that is full-color and high-resolution. The Fenix 3 HR can be worn in water up to 100m, so it’s great for swimming and splashes. Of course, you have access to Wi-Fi capabilities and Garmin-connectivity features as well. The Fenix 3 HR has a stainless-steel antenna that gives you GPS-satellite reception. 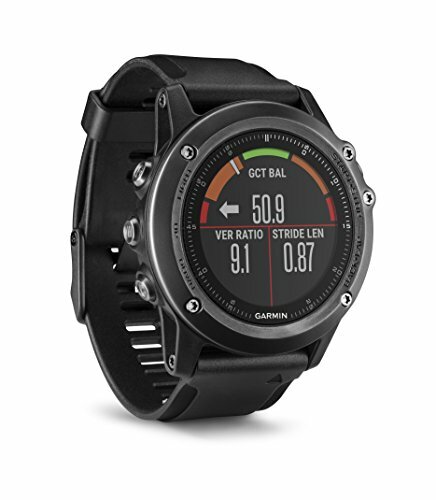 You can take advantage of outdoor navigation features like the barometer, altimeter, and compass; plus Garmin’s TracBack feature that allows you to retrace your steps. There are also fitness training features, including the VO2 Max, which crunches the data and monitors your running speed, heartbeats per minute, and heart-rate variability. It can even estimate the maximum volume of oxygen you consume each minute. Not just fot hiking, the Fenix 3 HR is great for any active person; hikers, backpackers, athletes, and more. Casio stays true to its name in delivering another in the impressive Pathfinder-watch series. 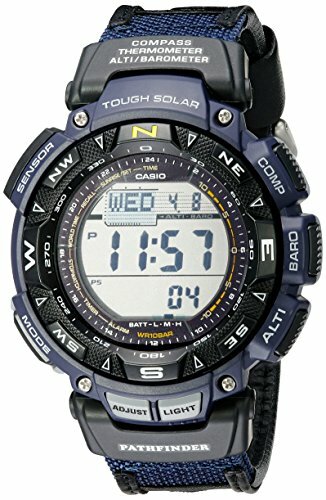 This Casio is designed using a cool, navy color and modern, black accents. The watch band is nylon, which is adjustable and great for people who find that standard bands may irritate their skin or become uncomfortable. The display and clock-face contain all the classic Casio information, with Quartz movement and a digital display. The Pathfinder watch is resistant to water up to 100m, features sunrise/sunset data, and is resistant to low temperatures. 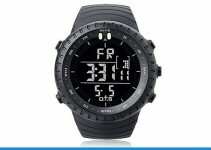 It can display world time, battery-power, calendar, timer, date, and more. 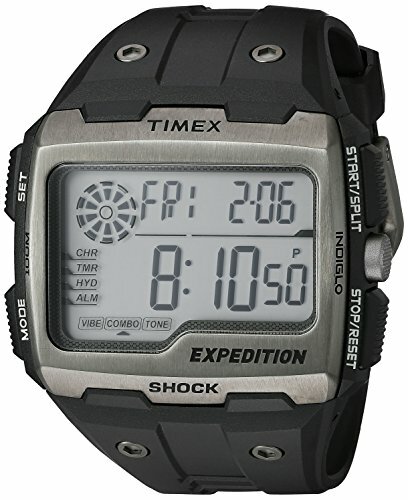 There is also a stopwatch, backlight with after-glow, alarms, and a power-saving function. You never have to worry about your watch dying either, since the Pathfinder is solar-powered. It can offer you readings from its triple sensor that works as an altimeter, compass, barometer, and thermometer.